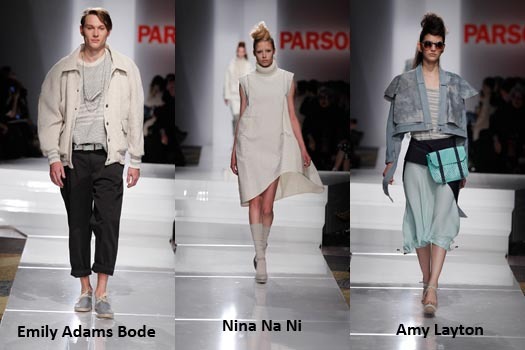 NEW YORK, May 2, 2012/ — Dubbed as the “2012 Fashion Show,” Parsons The New School for Design introduced Class 2012 with its legendary graduation fashion show featuring the works of the graduating class. This year’s event was hosted by Parsons alumni Carly Cushnie ’07 and Michelle Ochs ’07 of Cushnie et Ochs. The fashion show, which was held at Pier 60, Chelsea Piers at noon yesterday also kicked off the Second Annual Parsons Festival. The New School for Design’s annual runway show presents the top collections of graduating students as well as a static installion of select works and special projects. The event has helped launch the careers of some of the school’s most talented alumni, including Marc Jacobs ’84, Jack McCollough ’02 and Lazaro Hernandez ’02 of Proenza Schouler, and Cushnie and Ochs.